Packaged under strict guidelines of the International Bottled Water Association. 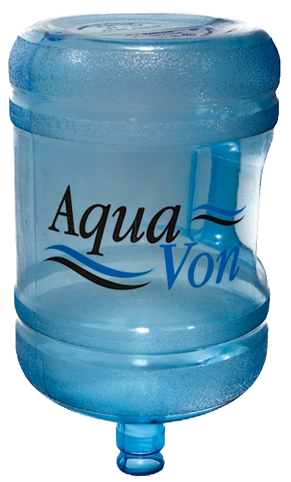 Extensive analysis assures you consistent quality in every drop of water. Our water is purified using a mutli-stage process that includes reverse osmosis, carbon filtration and ozonation. Reverse Osmosis removes dissolved salts, heavy metals and other contaminants in the ion form, leaving only the H2O. Carbon Filtration is utilized in two phases before and after reverse osmosis. The first phase, “Pre Carbon Filtration.” removes chlorine and other organics, including THM compounds created by chlorine. The second phase, “Post Carbon Filtration,” is a final polish that gives Aqua Von its great taste. Ozonation is the final process to sterilize the water. Ozone O3 is made by exposing air to high voltage electricity. This changes the O2 in the air to O3. Ozone is recognized as one of the most powerful germicidal agents for disinfection and does not leave a chemical residue in water. It is used in all quality bottled water products. Senior Citizen Delivery Only $2 per bottle!